Rose Marie Klaus, (T-6), born in 1942, was from Garfield, NJ. She attended St. Mary’s High School in Rutherford, then graduated with a B.A. from Douglass College in 1964. She joined the Peace Corps immediately out of college and worked at the Çocuk Yuvası in Kırklareli and İstanbul. Afterward, she earned a law degree and worked for the New York City Police Department. She died around 2004 of cancer. A friend from her grade school days in Garfield has been trying to find her to reconnect with their other friends. Rose Marie was one of the Turkey-06 volunteers serving in orphanages and engaged in early childhood education. She was a passionate volunteer. When I moved to Istanbul from Elazığ to work in the new state orphanage at Bakırköy, a modernist project of the times, I spent more time with Rose Marie and Ginny Pearsall Kirkwood who were also serving in İstanbul orphanages. When I needed a place to live in the Spring of 1966, Rose Marie and Ginny let me share their lovely apartment in Aksaray. I lost touch with Rose Marie a few years after we returned from Turkey. I was very happy to hear the news that she became a lawyer, and it is fitting that she worked for the NY City Police. I recall Rose Marie as a smart, tough, kind, and philosophical person -- always querying life. Rose Marie lived with me for the two year tour in Turkey. She was wonderful with the children at the Çocuk Yuvası where we served in Kırklareli during the first year, and during the second year we both worked in İstanbul but in separate orphanages where she was a good volunteer as well. She was a committed volunteer who had a sincere interest in the country and its history and in the job at hand. 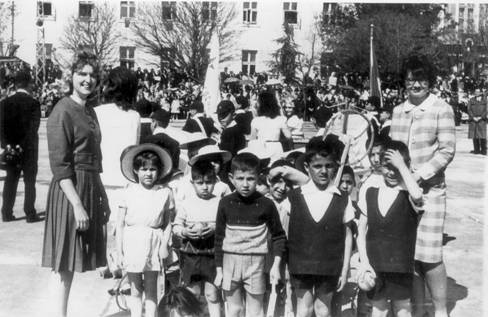 23 Nisan, 1965. Photo taken for Çocuk Bayramı in Kırklareli. With children from the orphanage, Ginny Pearsall Kirkwood is on the left and Rose Marie Klaus on the right.